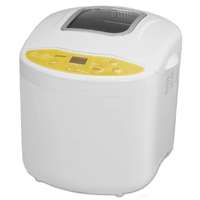 Lending an air of simplicity to the kitchen, the Breadman TR520 breadmaker is capable of creating a variety of delicious homemade bread. There are 8 different pre-programmed settings with 3 different crust shade options. The simple push button digital control panel is easy to navigate and program. The unit is equipped with a viewing window to monitor the progress of your fresh bread and has a 13-hour delay timer so your bread can be ready when you are. Cleaning up is a breeze, too, with the detachable lid and removable bread bin. Available for the excellent price of $60 to $80 online, this Breadman model is a surefire hit.